Designed with a very narrow profile in the leg, V style gussets at the top inside of the leg, twin spur rests placed at just the right height, and our new EquiStar™ Sole System. The EquiStar™ Field Boot is made of the finest lead free 'Leather Look' material, which provides a soft leather feel with superb wear. 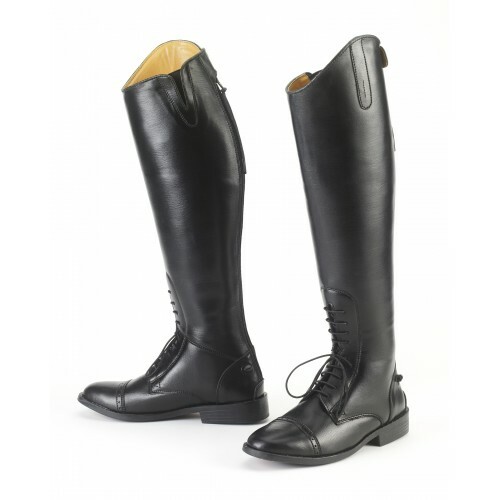 The shaft of the boot is cushion lined with Dry-Tex for superior moisture management. The top of the shaft is lined in synthetic leather for a traditional appearance. The EquiStar™ Sole System is long-lasting and designed to provide added comfort with its reduced weight and improved flexibility.